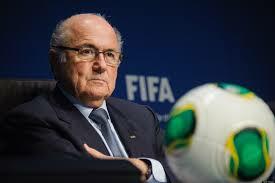 Sepp Blatter has refused to resign as Fifa president following a request from Uefa chief Michel Platini. The 79-year-old Swiss held an emergency meeting with key Fifa officials on Thursday after world football's governing body was subjected to yet more damaging corruption claims. Platini then made a personal appeal for Blatter to quit but was told it was "too late" to resign. Blatter later vowed to restore trust in Fifa and "find a way to fix things". Opening a meeting of Fifa's congress on the eve of Friday's presidential election, he said: "These are unprecedented and difficult times for Fifa. "It must fall to me to uphold responsibility for the well-being of the organisation." However, while admitting he could not be held responsible for the actions of a few, he conceded: "I'm sure more bad news may follow but it's necessary to restore trust in our organisation." His speech came just hours after Frenchman Platini said the latest crisis had left him "absolutely sickened", adding: "People have had enough, they don't want this president any more." Blatter, who has been president since 1998, is seeking a fifth term when he takes on Prince Ali bin al-Hussein in Friday's election. Several influential football figures had called for the vote to be delayed after seven Fifa officials were arrested in Zurich on Wednesday. But Uefa, which governs European football, decided on Thursday not to boycott the election and will continue to back Prince Ali, although some member associations, such as Russia, have said they will back Blatter.